Splashed around with some paint today and got ridiculously excited about it. I haven’t actually used any paint for ages but I have been working on a large drawing on gessoed MDF and just felt the need to experiment a bit. If all goes well I might put it in for the John Moore’s Painting Prize which does require paint! The exhibition catalogue arrived today for A Significant Curve, currently at High Cross House Dartington until the 17 November. The show looks great and I was very pleased with the hang. A musician played the Steinway Grand all evening the night of the Private View which was wonderful, especially given that a lot of the work in the show is a response to the sounds and silences which flow through the different spaces of the building. 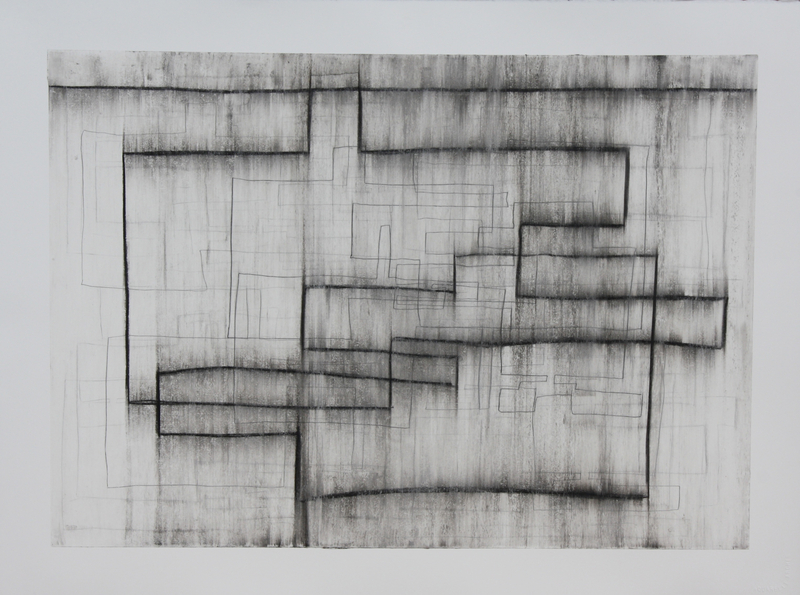 I went to look at this year’s Jerwood Drawing Prize shortlist this week at the Jerwood Space in London. This time last year I had a piece in it – happy memories. The show was good with some interesting work, mostly figurative plus the usual smattering of work which was in there because of the strange combination of media being used by the artist. This year there were five film pieces a couple of which were distinguished by their inordinate length. Leaving aside their evident quality, most selection boards average 10 to 30 seconds on each piece of work being presented to them so how do they square this with having to watch an animation for an hour and forty seven minutes? Or do they just watch it for the same number of seconds they accord framed work? If so they might miss something appalling and if they do accord these pieces their full amount of time it seems very unfair on other artists. The selectors don’t stand in front of their work and contemplate it for an hour and a half. There is a size limit on works submitted to public exhibitons, a practical solution to the problem of hanging large work but also an attempt to make sure sufficient work is hung. Perhaps it is time to consider a length limit on films submitted to opens. There is no facility for view such films, the longest piece in the Jerwood drawing show this year was sited in a corner closely surrounded by other work, no chair no sofa no dedicated viewing room. There was no way anyone would have been able to watch the whole of this piece from beginning to end. This is also an issue for the selectors themselves. 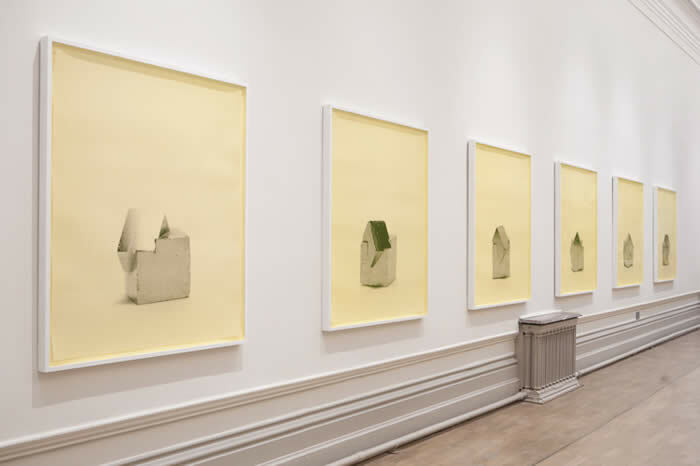 Selecting an exhibition is intensive, exhausting and because of the heightened sensibilities of viewing accessing and choosing works from a huge number, ultimately sleep depriving. In this year’s show nostalgia was definitely a recurring theme. There seemed to be a lot of work which grasped at the past, school photos, family reminiscences and poignant reminders of the fragility of life: in particular Emma Douglas’ heartbreaking Cato lived for 8025 days and Roy Eastland’s They looked like silver birds. The sun was shining on them… about an air raid during the First World War. Entirely different types of work but both of them beautiful and powerful. I came away having enjoyed the show but looking at the catalogue later it seemed subdued, samey and lacking in excitement. The information about the artists and their statements were mostly fascinating but somehow the images seemed bland – don’t know why – because they were not bland in the flesh. Last week I went to the PV of the Salisbury Open Drawing show at Salisbury Arts Centre in which I have a drawing. There was some very good work in that as well, many of the artists having previously exhibited in the Jerwood. Definitely worth a visit. I have a love hate relationship with the word interrogate. Actually its mostly hate! Considered a more rigorous term than merely questioning it has become the art speak term of choice for investigating something, often giving woolly ideas a veneer of intellectual seriousness which they do not merit. Every second artist seems to be interrogating something! My distrust, dislike of the term goes back a long way. As an eleven year old, in a school French exam I was confronted with the instruction,”convert the following sentences into the interrogative”. I was good at French easily capable of getting full marks for this but along with the rest of my class I got zero for that question because not one of us knew what interrogative meant. It clearly still rankles! I think art speak risks equating simple language with simplistic ideas. So, rant over, simplicity is where I am heading. I met up with my friend Jem this week for a drawing day. We have been doing this in a desultory way for a year or more but have now set ourselves a goal: to produce five pieces of work in just over a year. Although music is a common interest we are beginning to look at architecture and think about space and the simplicity of structures like cloisters. Sharing a variety of music throughout the day from Bach’s Cello Suites to Karl Jenkins The Armed Man, Mass for Peace to the opening bars of James Macmillan’s Tuireadh, his lament for the Piper Alpha disaster we settled down to draw. I am currently revisiting the compositions of Piero della Francesca and Fra Angelico and in our conversations we touched on the classical influences on Brunelleschi in the Ospedale degli Innocenti in Florence. I suspect that with these ideas fresh in my mind, having earlier observed a rhythm of light falling on angles of stone walls balanced by a riot of bare tree branches, I started my first drawing for this new project. Stone and Tree. I have no idea where it will go from here. Running in tandem with these regular drawing days I am about to start work on a new personal project in response to Bach’s cello music and I have just bought a large format sketchbook, 30 x 42 centimetres and a book of manuscript paper. So to work….. I love working in my sketchbooks. No pressure I just hop, slide, move, dance from one page onto the next, following my train of thought. 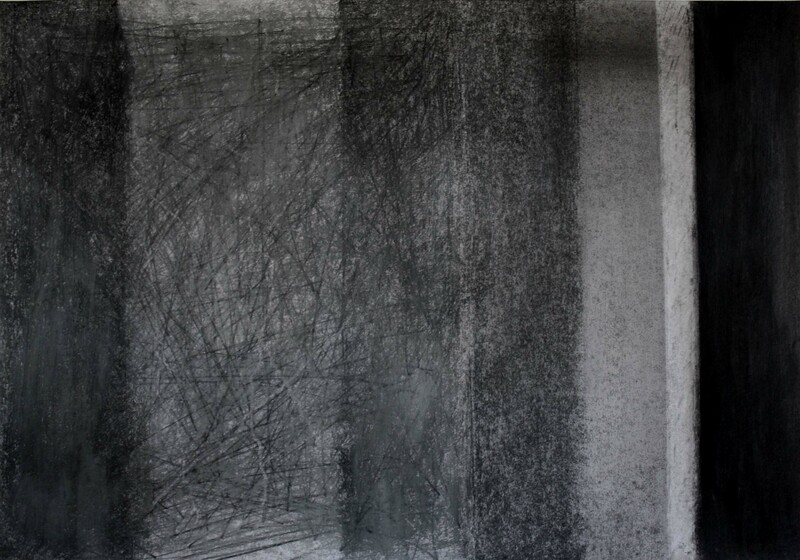 Making drawings from observation, rubbing them out drawing over them, playing with ideas. Thinking I’ll try that or I wonder what would happen if. It is the best way of visual thinking. The excitement, waiting to see what things will look like, knowing it doesn’t matter if it works or not because it is about finding out, opening doors not closing them. Taken from one of my Ballycastle sketchbooks which is full of drawings of Main Street, this little group of drawings started with a sketch of a derelict notice board, plywood streaked with rain-water stains. They then started absorbing the narrative of earlier drawings of the horizon and the cracks in the pavement of the same street.. I started my week reading into the small hours, the book, the mesmerising ‘The hand that first held mine’ by Maggie O’Farrell. The weaving narrative overlapping the Soho of the 1950s and contemporary London had a sustained air of menace. Wednesday to the Lighthouse in Poole to see the charismatic James Macmillan conduct his own compositions, The Sacrifice and The Confession of Isabel Gowdie, as well as Vaughan Williams’, Fantasia on a theme of Thomas Tallis and Laurence Power playing the Walton Viola Concerto. I love the rich timbre of the viola and Power played beautifully but it was the drama and huge sound of the Isabel Gowdie, which stole the show. Perfect illustration of why one should actually hear music live. The power and resonance of the 13 chords representing her 13 confessions boomed out in a way that just does not come across on a CD. At this point I realized why there was no theatre performance or film screening that night. Possibly too much sound! Wonderful. By Thursday I was back in London and did a quick loop around Cork Street before heading for the Watteau Show at the Royal Academy. Rose Hilton’s sumptuous paintings were on show at Messums. 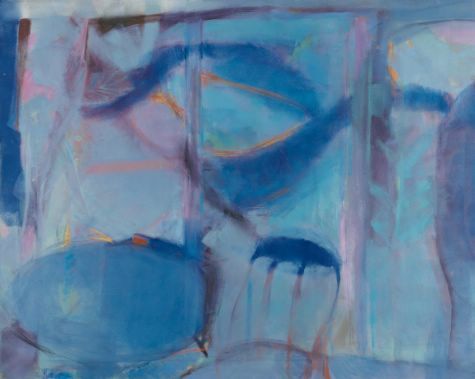 The blues of the very abstract Blue Café were pure Matisse and some of her nudes elsewhere had more than a passing nod to that master of loose flowing drawing. Many of the colours, yellows, oranges and thin layers of pinks suggested Bonnard particularly the Le Cannet paintings; the figure outlining is reminiscent of Cezanne’s contained fruits and stronger Fauve colours are there too. A riot of luscious colour, which led me to ponder the concept of a female palette. If Rose Hilton’s palette is feminine then so too must Bonnard’s have been, so perhaps it is more to do with the subject matter, the female toilette, the domesticity of interiors that suggest femininity rather than the colour. But I am not sure I am convinced! 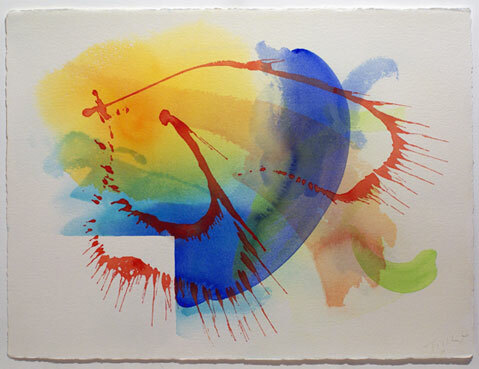 Next I moved up the road to the Bernard Jacobson Gallery to look at the William Tillyer watercolours. Here colour again, but dramatic masked out areas of white with dreaming swathes of palest hue gradually darkening, then suddenly punctuated by sharp curves of saturated colour stabbing outwards like anemone spines. Finally the Watteau drawings at the Royal Academy. Not too crowded but why do they hang them so that I get such a crick in my neck looking up at them? Surely it is easier for tall people to look down than it is for shorter people to look up! However to the point. Small drawings with amazingly fine lines and details given that most of them are in red chalk. They look as if they could be taken from sketchbooks but whether or not, they are studies, often containing different views, different angles and even later additions of a completely different subject on the same sheet. A fascinating insight into his process. It made me wonder how quickly he had drawn these and how much was from observation and how much from memory. There were hands, arms, exquisite little studies of girls’ heads, musicians, drapery and more. A must see exhibition on every level. The next day I pottered off to the Hayward Gallery on the south Bank to see the British Art Show 7. Just inside the door six of Phoebe Unwin’s paintings. 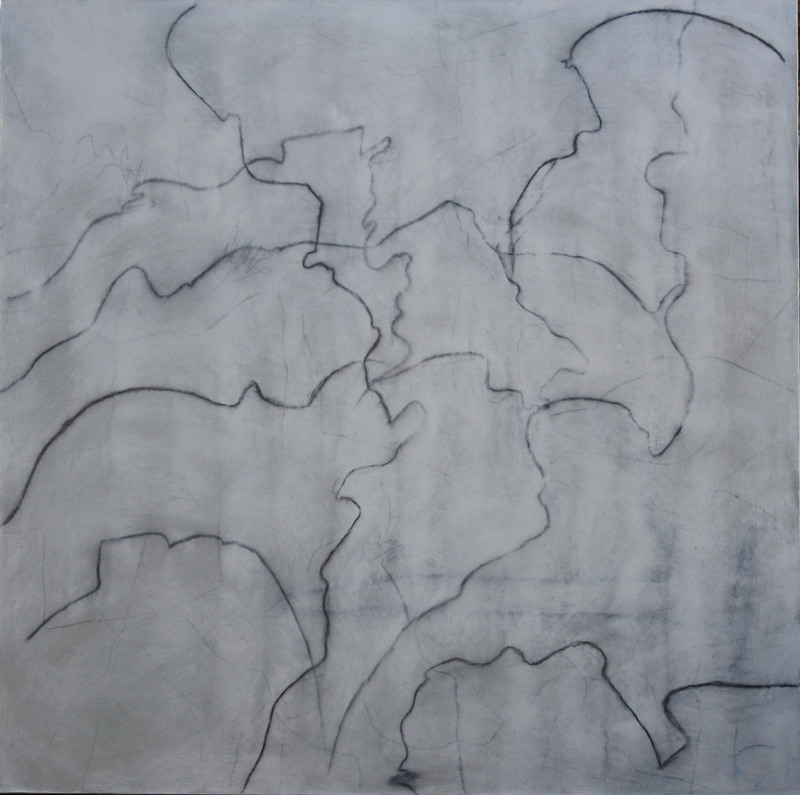 Abstract but with definite hints of figuration, something which is also even more evident in Maaike Schoorel”s paintings. White canvases, actually two black as well, with just the merest hint of a figure moving beneath the surface of the paint. You really need to stare at them for a long time for them to release their underlying image. Like almost everything in this show they demand time and there is so much there particularly the videos, some of them feature length. You could spend a couple of weeks full time absorbing it all. Christian Marclay’s video The Clock , which I dipped into, runs for twenty four hours, showing clips from old feature films where time is indicated by dialogue, or actual time pieces and it is run in real time. I had to tear myself away to go and catch my train which was also running in real time. Becky Beasley’s hugely enlarged photographs of Fool’s Gold, taken from every angle caught my eye because they looked like beautiful rubbed charcoal and wash drawings close up and then when you step back they come into focus. They reference Korrecktur the novel by Austrian writer Thomas Bernhard, each image being accompanied by a quotation from his text. This exhibition is challenging and meaty and the accompanying little booklet which comes free with the entrance ticket is a really useful and essential companion to the show. Going to see exhibitions always makes me want to rush home to the studio and get on with my work which is actually what I did when I got home on Friday. 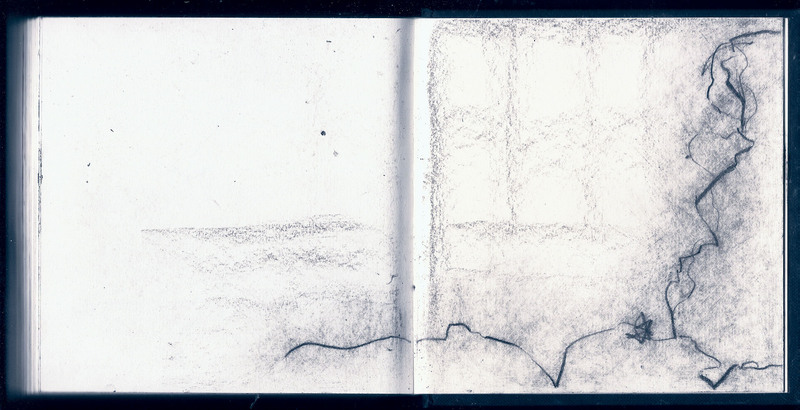 I did a small drawing based on the Horizons Sketchbook which was selected for the Sketch National Drawing Prize Show. I have meaning to explore this idea for a while and was fairly satisfied with the first of what I suspect will be a new group of drawings. I am not sure about the proportions of the masked out area so I expect I will revisit this in the coming days. New Horizons Sketchbook Drawing. Fiona Robinson, May 2011. Charcoal, graphite, white chalk, mixed media. Hundreds of thousands of people walk on pavements everywhere, every day, each leaving a little bit of their story behind. Mud, dust, wet footprints, a hair, a button, cigarette ends, sweet papers. As the pavements deteriorate and crack little bits of these multiple histories silt up the cracks leaving a residue of people, whose presence there was fleeting, or who have long ago died or moved away. If pavements could tell their stories…..the daily repetition – trudging to work, pushchairs, pub fights, dogs, rain, ice… The Cracks in the Pavement drawings open up their own stories, following the, lines covering them up, reinventing them. These are my little bits of history from Ballycastle in Co. Mayo. More tonal drawings and less line. I felt a sudden need to actually make seriously observed drawings of the landscape rather than very quick line drawings. These are quite big and I am not sure where they are going but I am enjoying them. I have just finished this, the largest drawing so far in the series, mapping my walks on Ballinskelligs Beach and the journey back up to Bolus Head. Whilst thinking about the way my work is going, the three drawings above have all been done in the last couple of weeks, I decided to re-read In Praise of Shadows by Junichiro Tanizaki. I had forgotten how lyrical it was. He talks of the patina granted to metal objects through use, a patina which is prized over shininess. He praises the quality that lamplight imparts and the silence and mystery of alcoves which never see the light of day. These thoughts seem appropriate to the qualities of the charcoal surfaces on which I am drawing. 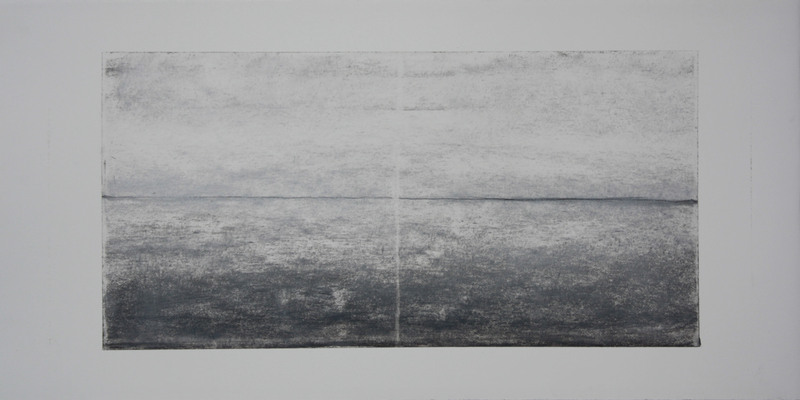 The patina on these drawings, rubbed with paper, speak of time, they are very labour intensive, and the pause between light and dark which happens at dusk or just before dawn. These are the qualities of light which I frequently saw at Cill Rialaig and with which I want to suffuse these drawings. I have been reading about and looking at the work of a German/Venezuelan artist Gego, (Gertrude Goldschmidt, 1912-1994) in a catalogue of an exhibition, ‘Gego, Between Transparency and the Invisible’ at The Museum of Fine Arts Houston in 2005. Essentially a sculptor investigating space and light, Gego also drew. 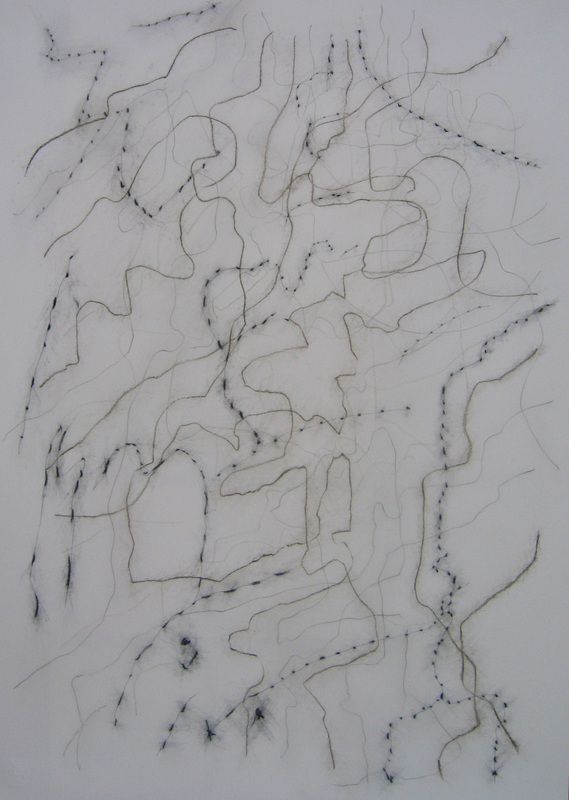 She made very beautiful wire drawings which, when reflected onto the wall behind them created a second set of drawings which are unattainable, ephemeral and ungraspable. It was the quality of transparency which she wanted to capture and they have a poignancy born of their fragility. For me they are evocative of memory which does not exist materially. Truly great drawing has a quality which is impossible to pin down; these drawings are impossible to pin down because in essence they do not exist. 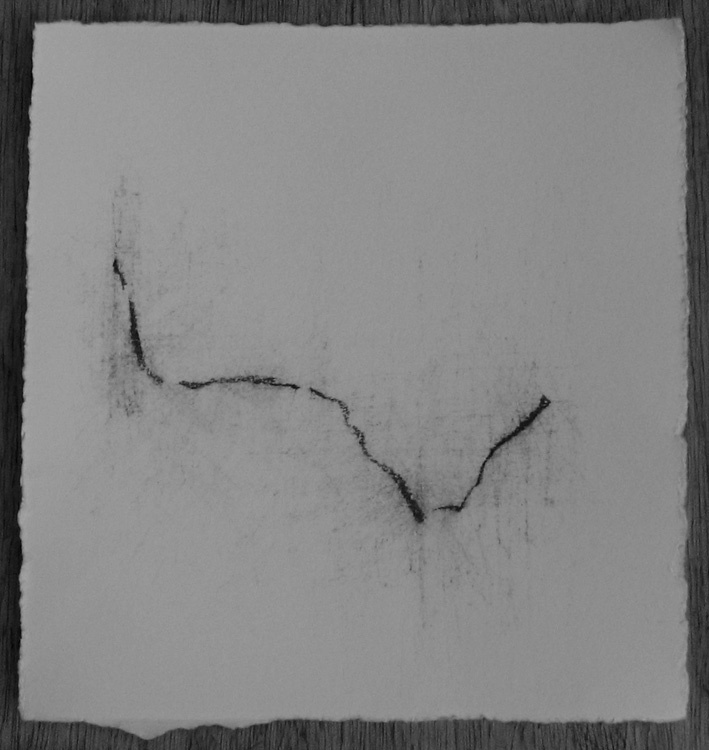 In the studio I made another drawing based on the Cill Rialaig Wall study in my sketchbook and then started to extract tiny marks and series of marks that were on those walls, isolating and enlarging them. The tiny world of Cill Rialaig was the whole world to the people who lived there at the time of Sean O’Conaill, as big as the whole world is today to 21st century well-traveled individuals. These drawings are also about reflection and memory. I enter my own head space whilst I am making them so that only I and the drawings exist and I am oblivious to my surroundings. Memories sometimes become huge, the event remembered, taking on a significance in retrospect that it didn’t have at the time. 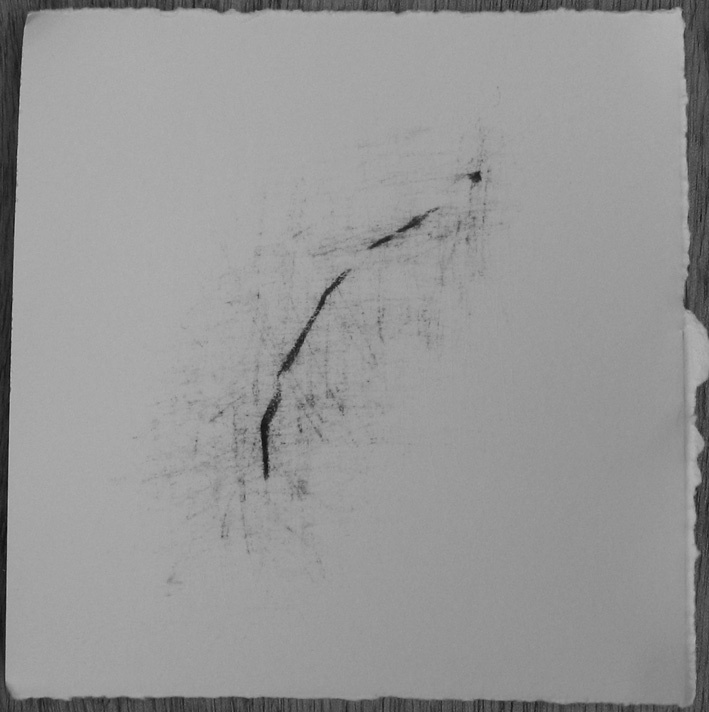 A suite of ten small drawings moving across the surface of Cill Rialaig Walls and extracting marks and movements.